Who: Brunch Drunk Love is brought to you by the team behind Popfeeder.com, which is now PM Group. From humble beginnings in Atlantic City, we are happy to announce our most recent expansion to Philadelphia by creating a Brunch party Philly has been waiting for so long. With our hands in HQ nightclub/beachclub to AC Daylife at the Chelsea and most recently Space Ibiza in New York City. We’ve been working extremely hard to bring you the best in entertainment, hospitality, and events. What: Unlike the normal “Brunch” where you sit and enjoy your favorite breakfast and lunch menu items, we bring you a NYC style champagne brunch party like no one has ever seen in Philadelphia. You get to sit and enjoy our special brunch menu then flip the tables and dance along with your favorite mix of EDM and Hip-hop. It might be 2pm, but the lights, the music, and the party will make it feel like a Philly night out at 2am. Vesper is a classic supper club with a new and modern twist. They are a hideaway, located in the heart of the city, where each and every night you will find good conversation, great service, delicious food, classic cocktails, and live music. The new version of Vesper has been re-imagined and recreated by owners Brendan Smith (Smith’s Bar & Restaurant and Milkhouse), Chuck Ercole (Misconduct Tavern) and John Barry (Smiths Bar & Restaurant). Why: Behind the music is a New York City resident Abdel Stoon. Playing for highly popular clubs including Lavo, Marquee, Highline Ballroom and VIP room NYC. 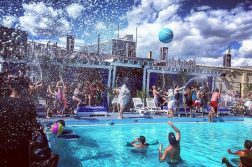 Mix in your favorite EDM and hip-hop with the quality of service behind many popular events by PM group; there will be no better day party and brunch in Philadelphia.